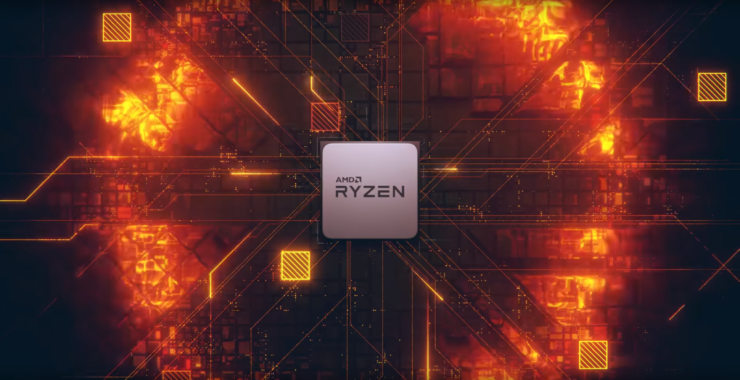 It looks like AMD’s recently released Ryzen 2000 series processors are starting to show that they have affected major retailers around the globe. One particular retailer whose statistics we have covered in the past, Mindfactory.de (via Computerbase), has posted the latest CPU market share report showing that AMD has once again managed to catch up with its competitor in the number of CPUs sold. When AMD released their first generation Ryzen processors, it took them a few months to catch up to Intel’s Kaby Lake processors. After they had caught up, AMD enjoyed a dominant position in the CPU market within Germany for a good four months but that was soon to be replaced by Intel who launched their 8th Gen Coffee Lake CPUs. The Coffee Lake lineup saw Intel regain their dominance in the CPU market by outselling every Ryzen chip by a fair margin. The Core i7-8700K alone sold more than the entire Ryzen 7 series processor lineup as we covered in the previous report. But last month, AMD released their second generation Ryzen processors, featuring a new process node and optimized architecture for faster clocks and better performance. This along with the new X470 platform has prompted many users to select AMD CPUs for their high-end mainstream PCs. 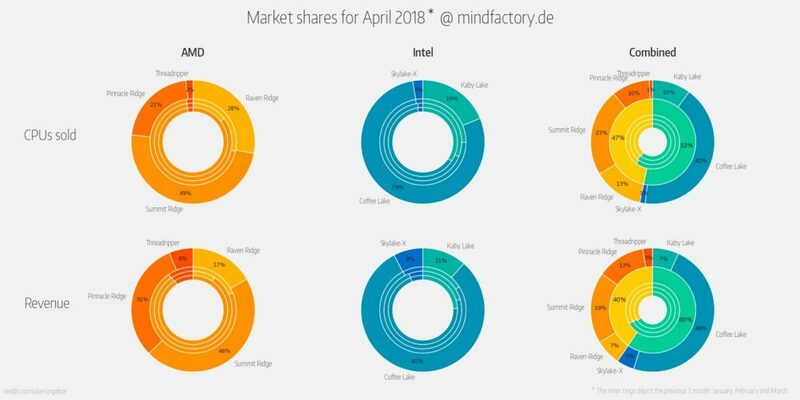 It is now shown in the latest report by Mindfactory.de that the Ryzen 7 2700X, just a month after release has managed to gain a good share in the number of AMD CPUs sold by the retailer. The Ryzen 7 2700X is a very strong chip if you consider its multitasking performance and even gaming results which have been improved over the previous generation. Other chips such as the Ryzen 3 2200G, Ryzen 5 2400G, and the Ryzen 5 2600 (X) series have also started to show their impact on the market. The G series APUs come in at a very sweet spot in terms of price to performance value and considered a great solution for budget PC builders. Overall, this has led to a significant jump in the AMD CPU share for the number of chips sold. A 7% jump compared to the last month is pretty huge. This puts the current number of AMD CPUs sold to 47 percent while Intel retains the top position with 53% CPUs sold via the retailer. Out of the 47 percent of AMD CPUs sold, 10% are Pinnacle-Ridge based while Summit Ridge still accounted for 23% of CPUs sold during April. On the Intel front, Coffee Lake amounts to 42% of the CPUs sold which is quite staggering. Intel also leads with the most CPU revenue since their top end i7-8700K remains the most popular chip on the market. The AMD CPU share will only increase in the coming months as Intel has no CPUs planned for launch till the 2nd half of 2018. Meanwhile, AMD will have their 2nd Generation Ryzen and Threadripper chips in the consumer market aiming both mainstream and HEDT segments.